Walker Adult Extra Wide with 5 Inch Wheels. If available in stock will ship in 1 business day. Adult Walkers by Medline Canada are especially designed for larger patients by giving then extra wide space for comfort. Made up of a lightweight Aluminium, its easy to transport. 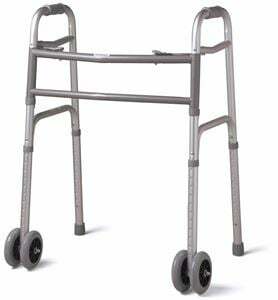 Features cross braces on each side of the walker and this provides durability. Extra wide frames upto 22" between hand grips can accommodate Bariatrics. Can hold upto 500 lbs. Available for Youth and Adult.